Sorry the recap is a bit late. I was off enjoying the usual holiday fun with my family and wasn't near a computer until now. I hope that you all had a wonderful Thanksgiving holiday. On behalf of the Editors of the Art Bead Scene I want to say THANK YOU to all our faithful readers...those who come to be inspired... those who make art beads... those who create jewelry... those who comment... those who just come to watch. You all make the Art Bead Scene what it is and for this we are grateful! 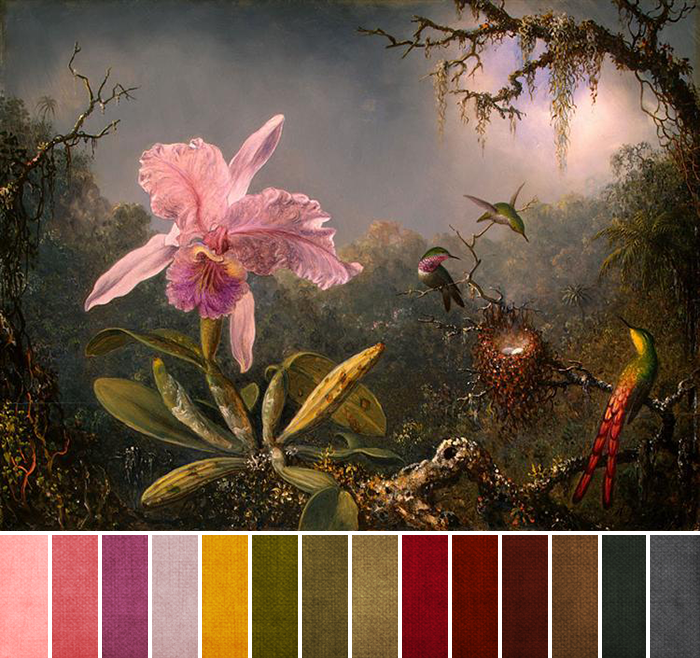 Our painting this month is a lush tropical scene. It is at once moody and vibrant. The impeccable details keep you coming back to see more. Your submissions for this month were equally as alive and intriguing. From bright blooms to darting hummingbirds, your jewelry and beads were a perfect complement to the painting. Last month I tried Kizoa as a slideshow. I did receive a few thumbs down on the slideshow idea but far more thumbs up! This time I tried a different service through Slide.ly. I would be curious to know what you think about this. I think it is pretty cool! November 2014 Art Bead Scene Monthly Challenge Recap. I loved it!! You really could see a lot more detail in each piece and the flow of it was really cool! Great job! Thanks for all your hard work ladies!! I loved it!! You really could see a lot more detail in each piece and the flow of it was really cool! Great job! Thanks for all your hard work ladies! Cool slide show... I like how it pops out and rotates to feature each piece. Pretty music too.Thanks for another Great challenge! Wonderful!! I love the music too!! Really nice pieces and I like the slides... just the music is a problem for me. It is really not working for me to open a webpage not knowing whether sound comes out or not.